As you all probably know, I love sewing and fabric. I make a lot of costumes and accessories using various fabrics. It won't surprise you then that I jumped at the chance to test out a new type of fabric. It's called Oly*Fun by Fairfield World. It's a woven synthetic fabric. The fibers have been fused to create a stiffer fabric material. It is very flexible, but can keep a sculpted shape easily. It comes in 18 different colors. 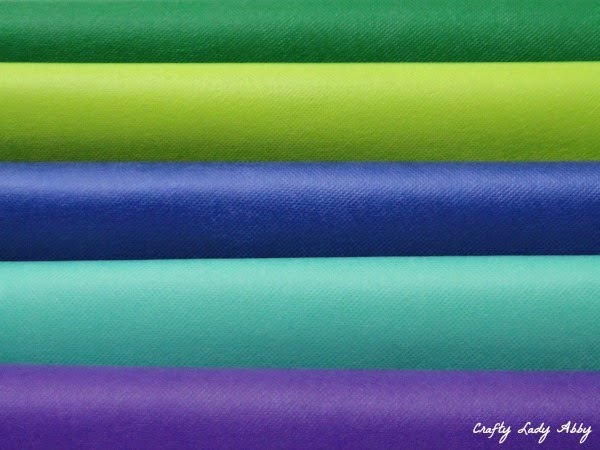 I chose clover (primary green), kiwi (lime green), jelly (dark purple), blueberry (primary blue), and sky blue (light blue) Oly*Fun fabric. I was sent a yard each of the 5 colors to test out. 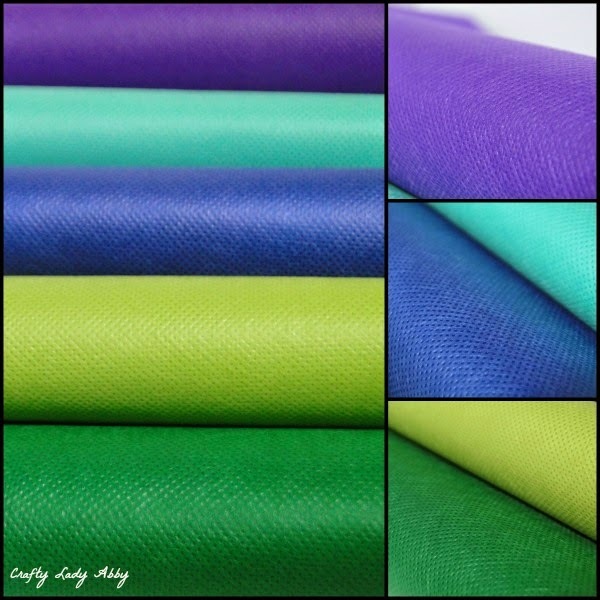 It has a lot of properties that most fabrics don't, which worked great for my needs. “The everything material” This is one of the easiest, most versatile materials you will ever find. You can sew it, glue it, staple it, pin it or tie it. You can write on it, paint it, embellish it, stamp it or stencil it. You can scissor, rotary, or die cut it. You can use it as fabric or use it as paper. You can use it indoors and outdoors. The only thing it won’t do is fray, tear, or fade so don’t bother hemming it. Solid color throughout. Use both the front and back. No white core or back side. No Fraying. Easy sew, no hemming required. Water resistant. Ideal for a wide variety of indoor and outdoor uses. If you can make it in Felt, you can make it in Oly*Fun, but it will be more weather and water resistant with a more tailored look and feel. This is a great material for beginner sewing. There is no grain, no selvage, no sizing, and no fraying." Since the fabric has a few properties that aren't typical of fabrics, I wanted to test some out that would suit my normal crafting needs. I sewed, glued, painted, cut, and drew on it. I will note, that I drew on it with a pencil before cutting out my shapes. Worked great, but I didn't photograph it. I didn't test it with markers, since that's not a normal material I would use. It cuts great. I don't have a die cut machine, to test that option. I used scissors to cut all the pieces. It would cut well with a rotary blade too. I rarely use one for any projects. I glided the scissors along the fabric, to see if it would cut easily that way, vs just individual snipping. That worked well too. I made this bag to show how easily it can cut long lines quickly, and cut smaller pieces. I used a geometric design to show how the fabric didn't need to be hemmed. It won't fray, because the fibers are fused together. Makes this a great fabric for designs like this. 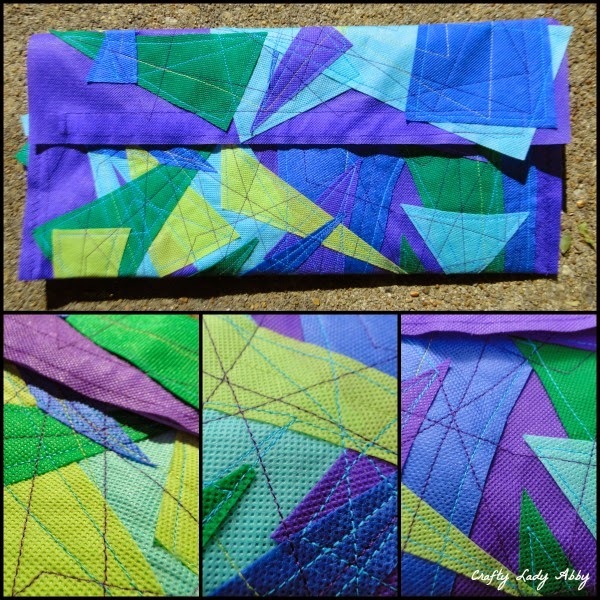 I used straight stitching with my sewing machine to secure the triangles to a rectangle of purple. Then, I folded the bag to create an envelope clutch. I sewed along the two sides, on the top, since the fabric won't fray. I sewed on Velcro to close the bag flap. Since the fabric did great with straight cuts and stitching, I wanted to test those further. I cut out amoeba shapes with my scissors. I stitched them together with my sewing machine, curving along the shapes, and adding shapes along the way. I created a freeform bib necklace. The fabric holds up great to layering. The sewing needle glided easily through the layers of fabric in both the bag and necklace. There was no tearing or trouble going through the layers. Since the necklace was easy to sew, I wanted to try something more detailed and less freeform. I made a series of different leaves. For these, I drew on the fabric with a pencil, to mark out the leaf shapes. I cut them out with the scissors. With the sewing machine, I stitched vein lines. The fabric held up great to overlapping and precise stitching. 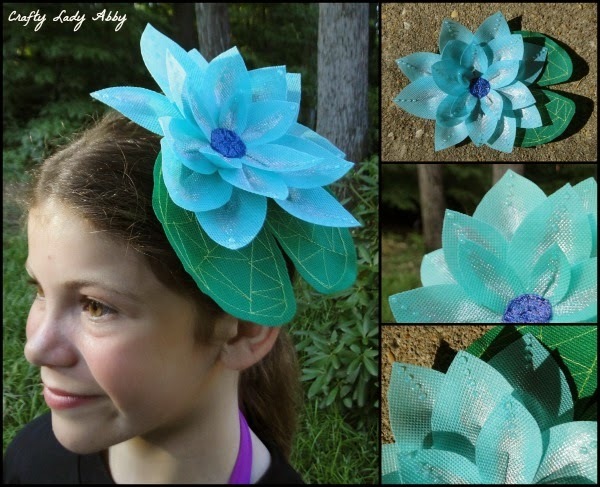 I made a faux headband with the basic leaves, by stitching them along a strip of Oly*Fun. For all the leaves, I hand sewed alligator clips to the back. I use a particular technique to sew on alligator clips to the normal hair flowers I make. The fabric held up well to being pierced multiple times in the same sections of fabric. The fabric has a stiffness that most thin fabrics don't have. I wanted to play with sculpting it a bit. I cut out flower petals in various sizes. I folded each petal and stitched from the middle to the end, like you would a dart, so the fabric was taken in a bit at one end of each petal. This resulted in petals that had some shape to them. If you don't do this dart technique, the petals will lay flat, and won't look flower like. I learned that from sewing another flower before this one. The fabric needed the shaping. I machine stitched the tapered ends of each petal to a circle of Oly*Fun, going from largest to smallest, in a circle. I machine stitched a smaller circle to the center of the flower, to hide the ends. I wanted to take this flower to another level, by painting it. I used silver fabric paint to make the petals glittery along the centers. I used dark blue dimensional glitter paint to fill in the flower center. I used a paint brush to smooth the dimensional paint out in the center. I used a light blue dimensional glitter paint to make rows of four dots along the center of each petal. This shimmery paint makes the flower appear more fantasy like. I also tested the water resistant fabric property. I dipped my brush into the water, and spread the paint on the petals out more, to blend the edges. The water didn't permeate the fabric, which was great. To test the soft sculpture ability some more, I made this headband. I cut strips of blue fabric, curving the lines. 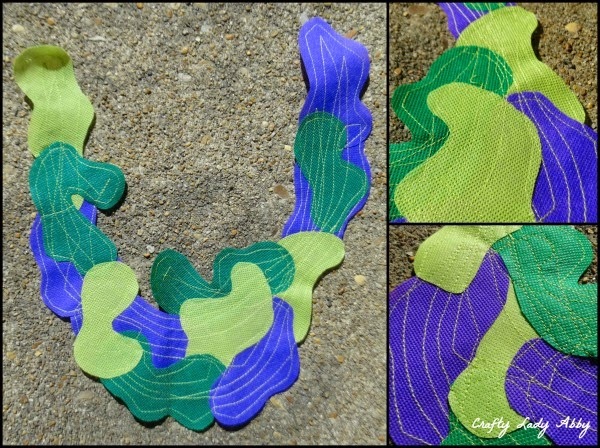 I machine stitched it to a small rectangle of Oly*Fun, in select places, to create a sculpted wave shape. I cut a 2nd small rectangle, the same size as the 1st. I put the two rectangles together, and machine stitched along one long edge, making sure not the sew through the sculpted waved piece too. I slipped on an elastic headband between the two rectangles, and machine stitched down the other long side. 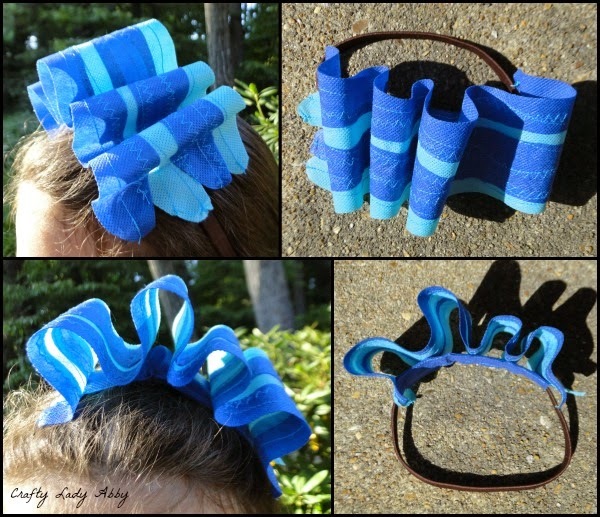 This turns the fabric shape into a wearable headpiece. Since the wave headband worked so well, I decided to make another head piece. I'd seen these great huge vertical hair bows (stands up off the head). I decided to make a stripy one for my daughter. (She's thrilled with it, and I'm sure it will make a middle school debut.) 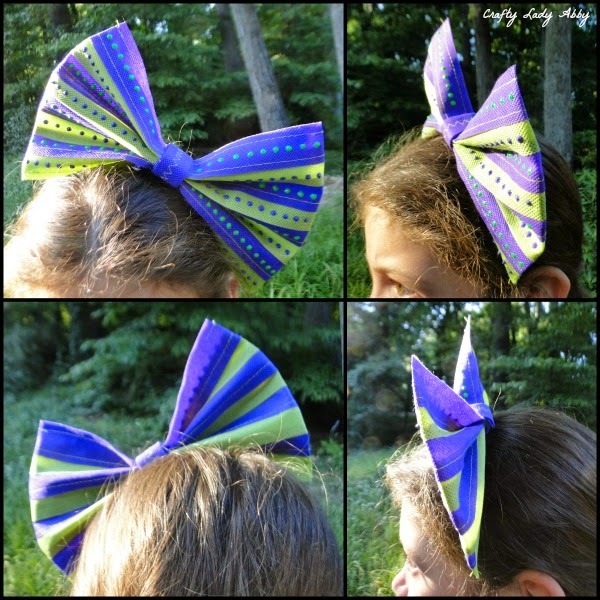 I created a tutorial for this DIY Striped Bow. "Oly*fun is sold on bolts and in quick grab and go packages. The bolted material is 60 inches wide and can be cut to whatever length you like. The grab and go package is 20 inches wide and includes 3 yards of material." I made a few projects to show what the product can do, however it's a versatile fabric. Here are some other designs made with Oly*Fun, highlighting some of it's properties. Overall, I'm really pleased with this product. I plan on making an apron for my daughter too, since she's often the messy artist, crafter...and eater. Since it's water resistant, it should act as a great barrier between wet things and her clothing. You can find more from Fairfield World on their website, store, Facebook, Twitter, Blog, and Pinterest. The Oly*Fun website has projects, a store, all the colors and more product info. DISCLOSURE: Fairfield World provided the Oly*Fun fabric for this review. All projects and opinions are my own. I just discovered this fabric inljne today, it looks amazing!!! Do you think it would be water resistant enough to make rain pants for my kids?